I started the month of October with the intention to celebrate our children to mark Children’s Day. I rallied my fellow Singapore Mum Bloggers to share stories on how we celebrate our children especially for some of our little ones who have gone through a difficult experience or period in their lives. Last week, Angeline shared a very heart breaking episode in her life when her little Princess had Kawasaki at two-years-old. As I read her story, I teared as I can’t imagine how much it pained her parents to see their little baby in the hospital. But at the end, I celebrated the courage of Dana as she overcame that very dark period in her life. The power of prayers and a healing God who cares. For Sophie, the most traumatic experience for her was when she had to battle with constipation woes for a good 14-15 months. That’s more than a year long and all I can say is Praise God, it’s behind us. It started off as a reluctance to go to the toilet when she just started potty training at around 16 months. But slowly the reluctance turned into a fear and that’s when her nightmare began. Like all new routines, Sophie got excited at being treated like a big kid when she first started potty training. However, the novelty slowly wore off and fear took over as she was conscious of dirtying herself even though we have never reprimanded her for soling herself. But after one too many times of holding back her poo, it soon it turned into a habit and she got very anxious and frightened each time she need to go. It got so bad to a point that she went without pooing for 6 days, leaving us no choice but to administer the suppository against her wishes. It was also then that I realized that kids have super strength in them, super physical strength all bundled up in their tiny little bodies. There are days when she would clasp her legs together so tight to prevent herself from pooing that we have no choice but to ply her legs apart and tried to pin her to her potty. It sounds cruel as I recount this but if you were in my shoes battling this with her, you’ll know that it’s totally not funny and as a mother I never wish or want to do this to her. Her cries pierced my heart each time she fights it and I wished I have the power to stop this whole nightmare for her. Before we went to such extreme ends, we tried every single piece of advice dished to us from probiotics, to yogurt, bananas, papaya, different potties, reading books about it, lots of encouragement, the cane, implementing a reward system and we even went as far as sticking a small bar of soap up her a** , no thanks to my mom who freaked even me out when Sophie cried in pain and fear. After trying months and months, we really didn’t want to be rude but after trying so many methods and seeing no results, we would only smile when we heard another, ” did you try….” no doubt there were all well-meaning but they definitely don’t know how much it pains us as parents to see her struggle. We also asked our friends so pray for Sophie during this very trying period as were also tired by the constant battles. So how did Sophie overcome her constipation episode? Lots of encouragement, patience and prayers. I think age played a part too as she understood why she can’t keep it inside her. Till today, it still hurts when she needs to the point that that it may bleed a little (yes we’ve asked the doctor and they’ve said, it’s normal). Looking back, this was one of my most difficult parenting struggles. And my advice to those with kids who suffer from constipation, never force. While we have threaten with the cane and even forced her to sit on the potty, I would still say that you know your child best. Know what motivates them and keeping doing that. During that time, we did have some success along the way. Like with the “X” stance we taught her so that she would stop clasping her legs together. Be patient, be very very patient and the worst will be over. If you’re interested, these are a few of my earlier posts on what we did and what helped too. I hope that your child overcomes their constipation woes very soon. With your encouragement, they can do it! 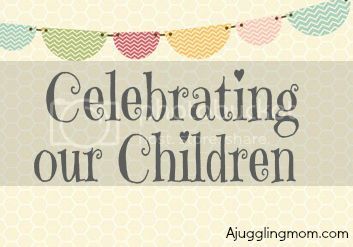 If you have a story on your child worth celebrating, do link up with the Celebrating our Children link above! Every child is worth celebrating. Ya, make it a happy thing. We cheered when mine manage to do it. Btw, bananas are bad for constipation. Don’t give bananas if they are constipated. Contrary to common beliefs, it is for diarrhea. Chirpy Bird: yes its insoluble fibre so harder to digest for kids. Well done Sophie. I’ve had constipation before so I know it must feel much more terrible and frightening for a little kid. Thank God she overcame it! Yes, we’re so thankful it’s behind us too. Praise God. Well done Sophie! I know how frightening constipation can be as I had it too. It extremely painful for an adult, and imagine how it must be for a child! Glad that Sophie is better now. You too Winnie? I do hope it doesn’t happen again for her when she grows older. Yah.. I had it after I had my older girl, after the one month confinement. because the older folks said cannot drink water, only can drink red dates tea, I followed accordingly. And also, I was restricted to confinement food, and didn’t have enough fibre. So the few months after that, I had constipation. It recovered only after a few months. I was even scared to go to the toilet. Then when I had my younger boy, I made sure I had more water and fibre, despite what the older folks said. One bad experience was enough. Good to hear she’s okay now!